Precious metals futures kicked off the new trading week with some division as silver and platinum declined and gold and palladium gained. Palladium scored another all-time record settlement — its second in a row. Gold for February delivery rose $4.10, or 0.3%, to settle at $1,289.90 an ounce on the Comex division of the New York Mercantile Exchange. 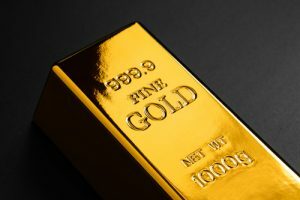 "The market is reconsidering its expectations for Fed rate hikes and as the expectations have been scaled back gold prices have been able to edge higher," Reuters quoted Suki Cooper, precious metals analyst at Standard Chartered Bank. Gold futures ranged from a low of $1,284.10 to a high of $1,297. They edged up 0.2% last week. Last Thursday, they closed at $1,294.80 an ounce for their best settlement since June. 14. Ending lower for a second session in a row after rising for seven straight, silver for March delivery slipped 3 cents, or 0.2%, to $15.756 an ounce. Silver futures traded between $15.70 and $15.88. They advanced last week by 2.3%. On Thursday, the metal registered its best settlement — at $15.797 an ounce — since July 16. April platinum declined $2.90, or 0.4%, to $824.30 an ounce, ranging from $823.30 to $836.50. Palladium for March delivery rose $5.80, or 0.5%, to $1,240.20 an ounce — another new record close. Palladium prices traded between $1,230.80 and $1,249.40. Both jumped last week. Gains reached 3.9% for platinum and 4.3% for palladium. Gold added $12.30, or 1%, to $1,292.20 an ounce. Silver rose 4.5 cents, or 0.3%, to $15.75 an ounce. The United States Mint started accepting orders today for its 2019-dated American Eagle and Buffalo bullion coins. Early sales are strong, and up from a year ago. American Silver Eagles reached 2,521,000 coins compared to last year’s debut of 2,495,000 coins. The single-day haul is already higher than all but two of the monthly totals in 2018. A combined 42,500 ounces in American Gold Eagles sold versus the 33,000 ounces moved in the early going last year. The total is higher than all but one of the monthly totals in 2018. American Buffalo gold coins total 16,500 ounces compared to last year’s start of 13,000 ounces. The one-day total is higher than all but three of the monthly totals in 2018. Lastly, American Platinum Eagles reached 18,200 coins. The 2018-dated edition launched Feb. 12, 2018 and garnered first-day sales of 15,000 coins.